This article is about the 18th-century ship. For other ships or uses of the same name, see Bounty (disambiguation). Bounty was originally the collier Bethia, built in 1784 at the Blaydes shipyard in Hull, Yorkshire in England. The Royal Navy purchased her for £1,950 on 23 May 1787 (equivalent to £209,000 in 2016), refit, and renamed her Bounty. The ship was relatively small at 215 tons, but had three masts and was full-rigged. After conversion for the breadfruit expedition, she was equipped with four 4-pounder (1.8 kg) cannon and ten swivel guns. The Royal Navy had purchased Bethia for a single mission in support of an experiment: the acquisition of breadfruit plants from Tahiti, and the transportation of those plants to the West Indies in the hope that they would grow well there and become a cheap source of food for slaves. Sir Joseph Banks had proposed the experiment and had recommended William Bligh as commander. Bligh in turn was promoted through a prize offered by the Royal Society of Arts. In June 1787, the Bounty was refitted at Deptford. The great cabin was converted to house the potted breadfruit plants, and gratings were fitted to the upper deck. 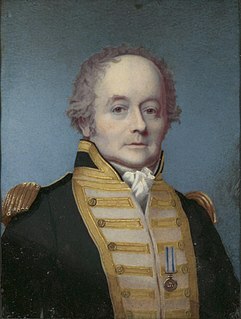 William Bligh was appointed Commanding Lieutenant of the Bounty on 16 August 1787 at the age of 33, after a career that included a tour as sailing master of James Cook's Resolution during Cook's third and final voyage (1776–80). The ship's complement was 46 men: a single commissioned officer (Bligh), 43 other Royal Navy personnel, and two civilian botanists. On 23 December 1787, the Bounty sailed from Spithead for Tahiti. For a full month, the crew attempted to take the ship west, around South America's Cape Horn, but adverse weather prevented this. Bligh then proceeded east, rounding the southern tip of Africa (Cape Agulhas) and crossing the width of the Indian Ocean. 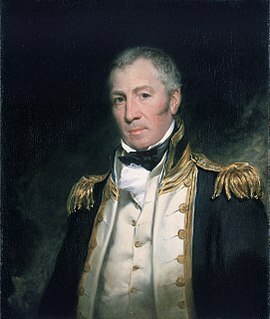 During the outward voyage, Bligh demoted Sailing Master John Fryer, replacing him with Fletcher Christian. This act seriously damaged the relationship between Bligh and Fryer, and Fryer later claimed that Bligh's act was entirely personal. Bligh is commonly portrayed as the epitome of abusive sailing captains, but this portrayal has recently come into dispute. Caroline Alexander points out in her 2003 book The Bounty that Bligh was relatively lenient compared with other British naval officers. Bligh enjoyed the patronage of Sir Joseph Banks, a wealthy botanist and influential figure in Britain at the time. That, together with his experience sailing with Cook, familiarity with navigation in the area, and local customs were probably important factors in his appointment. The Bounty reached Tahiti on 26 October 1788, after ten months at sea. Bligh and his crew spent five months in Tahiti, then called "Otaheite", collecting and preparing 1,015 breadfruit plants to be transported. Bligh allowed the crew to live ashore and care for the potted breadfruit plants, and they became socialized to the customs and culture of the Tahitians. Many of the seamen and some of the "young gentlemen" had themselves tattooed in native fashion. Master's Mate and Acting Lieutenant Fletcher Christian married Maimiti, a Tahitian woman. Others of the Bounty's warrant officers and seamen were also said to have formed "connections" with native women. After five months in Tahiti, the Bounty set sail with her breadfruit cargo on 4 April 1789. Some 1,300 miles (2,100 km) west of Tahiti, near Tonga, mutiny broke out on 28 April 1789. Despite strong words and threats heard on both sides, the ship was taken bloodlessly and apparently without struggle by any of the loyalists except Bligh himself. Of the 42 men on board aside from Bligh and Christian, 22 joined Christian in mutiny, two were passive, and 18 remained loyal to Bligh. The mutineers ordered Bligh, two midshipmen, the surgeon's mate (Ledward), and the ship's clerk into the ship's boat. Several more men voluntarily joined Bligh rather than remain aboard. Bligh and his men sailed the open boat 30 nautical miles (56 km) to Tofua in search of supplies, but were forced to flee after attacks by hostile natives resulted in the death of one of the men. Bligh then undertook an arduous journey to the Dutch settlement of Coupang, located over 3,500 nautical miles (6,500 km) from Tofua. He safely landed there 47 days later, having lost no men during the voyage except the one killed on Tofua. The mutineers sailed for the island of Tubuai, where they tried to settle. After three months of bloody conflict with the natives, however, they returned to Tahiti. Sixteen of the mutineers – including the four loyalists who had been unable to accompany Bligh – remained there, taking their chances that the Royal Navy would not find them and bring them to justice. HMS Pandora was sent out by the Admiralty in November 1790 in pursuit of the Bounty, to capture the mutineers and bring them back to England to face a court martial. She arrived in March 1791 and captured fourteen men within two weeks; they were locked away in a makeshift wooden prison on the Pandora's quarterdeck. The men called their cell "Pandora's box". 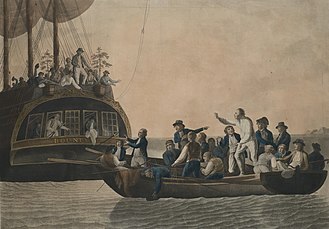 They remained in their prison until 29 August 1791 when the Pandora was wrecked on the Great Barrier Reef with the loss of 35 lives; four of them (Stewart, Sumner, Skinner and Hildebrand) were mutineers. Immediately after setting the sixteen men ashore in Tahiti in September 1789, Fletcher Christian, eight other crewmen, six Tahitian men, and 11 women, one with a baby, set sail in the Bounty hoping to elude the Royal Navy. According to a journal kept by one of Christian's followers, the Tahitians were actually kidnapped when Christian set sail without warning them, the purpose of this being to acquire the women. The mutineers passed through the Fiji and Cook Islands, but feared that they would be found there. Continuing their quest for a safe haven, on 15 January 1790 they rediscovered Pitcairn Island, which had been misplaced on the Royal Navy's charts. After the decision was made to settle on Pitcairn, livestock and other provisions were removed from the Bounty. To prevent the ship's detection, and anyone's possible escape, the ship was burned on 23 January 1790 in what is now called Bounty Bay. The mutineers remained undetected on Pitcairn until February 1808, when sole remaining mutineer John Adams and the surviving Tahitian women and their children were discovered by the Boston sealer Topaz, commanded by Captain Mayhew Folger of Nantucket, Massachusetts. Seventeen years later, in 1825, HMS Blossom, on a voyage of exploration under Captain Frederick William Beechey, arrived on Christmas Day off Pitcairn and spent 19 days there. Captain Beechey later recorded this in his 1831 published account of the voyage, as did one of his crew, John Bechervaise, in his 1839 Thirty-Six Years of a Seafaring Life by an Old Quarter Master. Beechey wrote a detailed account of the mutiny as recounted to him by the last survivor, Adams. Bechervaise, who described the life of the islanders, says he found the remains of the Bounty and took some pieces of wood from it which were turned into souvenirs such as snuff boxes. The details of the voyage of HMAV Bounty are very well documented, largely due to the effort of Bligh to maintain an accurate log before, during, and after the actual mutiny. Bounty's crew list is also well chronicled, down to and including the names of every seaman on board, something which larger ships in the rating system only occasionally were capable of due to crews in the hundreds whereas the Bounty carried fewer than fifty personnel. 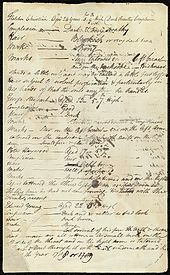 Bligh's original log remained intact throughout his ordeal and was used as a major piece of evidence in his own trial for the loss of the Bounty as well as the subsequent trial of captured mutineers. The original log is presently maintained at the State Library of New South Wales with available transcripts in both print and electronic format. 30–31 May: Bounty launch transits to a second nearby island, named "Sunday Island"
1–2 June: Bounty launch transits forty two miles to a third island, named "Turtle Island"
In the 18th century Royal Navy, rank and position on board ship were defined by a mix of two hierarchies—an official hierarchy of ranks (commissioned officers, warrant officers, petty officers, and seamen) and a conventionally recognized social division between gentlemen and non-gentlemen. Royal Navy uniforms were often used to denote rank and position on board ships; however, uniforms were not worn daily on board while Bounty was underway due to the lengthy and isolated voyage. At the top of the official rank hierarchy were the commissioned officers; on a larger warship, the commissioned officers included the captain, several lieutenants to command watches, and the officers commanding the Royal Marines on board the ship. The Bounty, however, carried no marines and no commissioned officers other than Lieutenant Bligh himself, who served as master and commander of the ship. He was the ship's captain, and he occupied a private cabin. Next below the commissioned officers came the warrant officers, such as the sailing master, surgeon, boatswain, purser, and gunner, who were as likely to be considered skilled tradesmen as gentlemen. As the senior warrant officer, the sailing master and his mates were entitled to berth with the lieutenants in the wardroom (though, in this case, there were no lieutenants there); other warrant officers berthed in the gunroom. Like commissioned officers, warrant officers had the right of access to the quarterdeck and were immune from punishment by flogging. They held their warrants directly from the navy, and the captain could not alter their rank. Roman Catholics were allowed to serve as warrant officers, but not as commissioned officers. Below the warrant officers came the petty officers. The petty officers included two separate groups: young gentlemen training to be future commissioned officers, often serving as midshipmen or master's mates, and tradesmen working as skilled assistants to the warrant officers. The young gentlemen technically were without ratings, holding a rank below warrant officers at the mercy of the captain but, as aspiring future commissioned officers, they were considered socially superior and were often given a watch (with authority over some warrant officers) or a minor command. Finally, at the bottom of the hierarchical tree were the seamen, divided into able seamen and ordinary seamen. Aboard some vessels, an even lower grade existed called landsmen who were seamen-in-training with very little or no naval skill. The only seamen mustered into the crew of the Bounty were able seamen; the ship did not carry any ordinary seamen or landsmen due to the vessel's long and fairly important mission. Note, however, that the young gentlemen might also be rated as seamen rather than midshipmen on the ship's books, though they were still considered the social superiors of the seamen, petty officers (excluding other young gentlemen), and most warrant officers, and could be given authority over them. In the immediate wake of the mutiny, all but four of the loyal crew joined Captain Bligh in the long boat for the voyage to Timor, and eventually made it safely back to England, unless otherwise noted in the table below. Four were detained against their will on the Bounty for their needed skills and for lack of space on the long boat. The mutineers first returned to Tahiti, where most of the survivors were later captured by the Pandora and taken to England for trial. 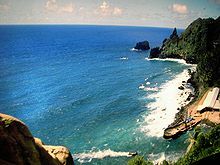 Nine mutineers continued their flight from the law and eventually settled on Pitcairn Island, where all but one died before their fate became known to the outside world. Luis Marden discovered the remains of the Bounty in January 1957. After spotting remains of the rudder (which had been found in 1933 by Parkin Christian, and is still displayed in the Fiji Museum in Suva), he persuaded his editors and writers to let him dive off Pitcairn Island, where the rudder had been found. Despite the warnings of one islander – "Man, you gwen be dead as a hatchet!" 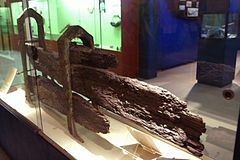 – Marden dived for several days in the dangerous swells near the island, and found the remains of the ship: a rudder pin, nails, a ships boat oarlock, fittings and a Bounty anchor that he raised. He subsequently met with Marlon Brando to counsel him on his role as Fletcher Christian in the 1962 film Mutiny on the Bounty. Later in life, Marden wore cuff links made of nails from the Bounty. Marden also dived on the wreck of HMS Pandora and left a Bounty nail with Pandora. Some of the Bounty's remains, such as the ballast stones, are still partially visible in the waters of Bounty Bay. The last of Bounty's four 4-pounder cannon was recovered in 1998 by an archaeological team from James Cook University and was sent to the Queensland Museum in Townsville to be stabilised through lengthy conservation treatment, i.e. nearly 40 months of electrolysis. The gun was subsequently returned to Pitcairn Island where it has been placed on display in a new community hall. US Coast Guard photo of the 1960 Bounty replica sinking during Hurricane Sandy in October 2012. 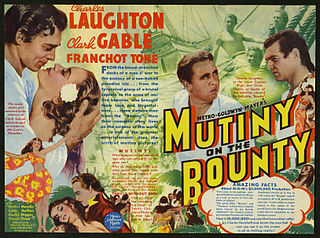 When the 1935 film Mutiny on the Bounty was made, sailing vessels (often with assisting engines) were partly still in use and existing vessels were adapted to play Bounty and Pandora. A second Bounty replica, named HMAV Bounty, was built in New Zealand in 1979 and used in the 1984 film The Bounty. The hull is constructed of welded steel oversheathed with timber. For many years she served the tourist excursion market from Darling Harbour, Sydney, Australia, before being sold to HKR International Limited in October 2007. She is now a tourist attraction (also used for charter, excursions and sail training) based in Discovery Bay, on Lantau Island in Hong Kong, and has an additional Chinese name 濟民號. ^ C. Knight, "HM Armed Vessel Bounty," Mariner's Mirror 22 (1936). Retrieved 23 January 2009. ^ Winfield, Rif (2007). British Warships in the Age of Sail, 1714–1792: Design, Construction, Careers and Fates. Barnsley: Seaforth Publishing. p. 335. ISBN 978-1-84415-700-6. ^ "Cannon from HMAS Bounty". Archived from the original on 3 November 2012. Retrieved 31 October 2012. ^ Erskine, Nigel (May – June 1999). "Reclaiming the Bounty". Archaeology. 52 (3). Retrieved 31 October 2012. ^ See picture of cannon at; for the disposition of the four ship's cannons see. ^ Alexander, C. (2003). The Bounty: The True Story of the Mutiny on the Bounty. ISBN 0-00-653246-2. ^ "William Bligh". Find a Grave. Retrieved 29 March 2010. ^ "Bounty's Crew Encyclopedia". Retrieved 8 April 2009. ^ a b "The 'Bounty's' Last Relics". Life. 44 (6): 38–41. 10 February 1958. Retrieved 31 October 2012. ^ Jenkins, Mark (3 March 2003). "National Geographic Icon Luis Marden Dies". National Geographic. Retrieved 13 May 2007. ^ "Bounty anchor at the town square". Archived from the original on 26 October 2012. Retrieved 31 October 2012. ^ "HMS Pandora Encyclopedia". Pitcairn Islands Study Center. Pacific Union College. Retrieved 31 October 2012. 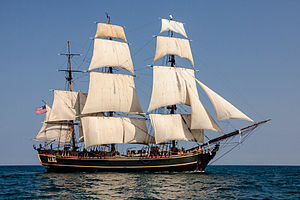 ^ "Hurricane Sandy: Hurricane Sandy sinks tall ship HMS Bounty". CBS News. Retrieved 29 October 2012. ^ Grier, Peter (29 October 2012). "The story behind the HMS Bounty, sunk by Sandy off N.C. coast". Christian Science Monitor. Retrieved 31 October 2012. ^ Jonsson, Patrik (30 October 2012). "HMS Bounty casualty claimed tie to mutinous Fletcher Christian". Retrieved 31 October 2012. ^ Allen, Nick (31 October 2012). "Sandy's Bounty victim was descendent of man who led famous mutiny". Daily Telegraph. Retrieved 31 October 2012. ^ Dolak, Kevin; Effron, Lauren (30 October 2012). "Woman Dies After Hurricane Sandy Ship Rescue". ABC News. Retrieved 31 October 2012. ^ Dalesio, Emery P.; Lush, Tamara (31 October 2012). "HMS Bounty: Search for missing captain continues". Christian Science Monitor. Retrieved 29 October 2012. ^ "The Bounty" (PDF). 24 October 2012. Retrieved 1 November 2012. Photo gallery of HMS Bounty replica at Tall Ships Nova Scotia 2009 and 2012. This is a list of books in the English language which deal with the Pitcairn Islands and their geography, history, inhabitants, culture, biota, etc.